If you have an enquiry, please contact our professional clerks on 01604 636271.
and commitment to each individual case and are well equipped to meet the specific needs of our clients, striving wherever possible to ensure that a case stays with the instructed Member of Chambers until completion. and integrity in all areas of our business, along with the convenience, practicality and accessibility of a local Chambers, managed by our dedicated and approachable team of clerks and administrators. of service whenever we are instructed and can provide the best quality legal advice and representation in the area to our valued long standing clients, new instructors and members of the public. of information and a clear understanding of each presented case, guaranteeing our fullest attention and focussed expertise at all times. 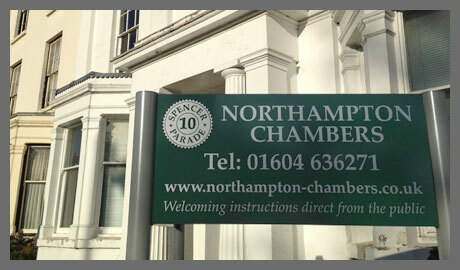 Northampton Chambers is delighted to welcome Mr Charles Hogan as a tenant, following his successful completion of pupillage. We would like to wish Charles the best of luck with his career at the Bar.